Boulderkeskus juhlii kymmenvuotista taivaltaan BK CUPin finaalin sekä iltakemujen merkeissä 17.11. BK Espoossa! Haluamme lämpimästi kutsua teidät kaikki huikeaan päivään, jossa syödään kakkua, saunotaan ja fiilistellään mielettömiä kiipeilysuorituksia loistavan musiikin siivittämänä. Olisi ilo saada sinut mukaan tähän riemuisaan päivään! 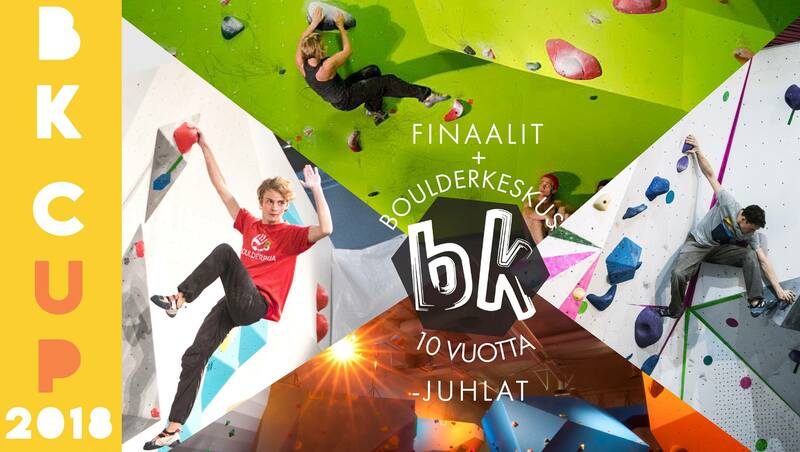 BK celebrates its tenth anniversary at the BK CUP finals on the 17th of November at BK Espoo! We warmly invite you all to this fantastic day where we eat cake, have fun activities, go to sauna and wonder about the amazing climbing performances with good music and great company. It would be a pleasure have you celebrate with us! On the day of the celebration, climbing in Espoo is possible by participating in the BK CUP competition (sign up via the Problemator application). If you don't feel like competing, there may possibly be some little climbing activity before the finals ;) So take your climbing shoes with you just in case!